They say: “The volunteers will be selling freshly made sandwiches from the snack bar, along with delicious cakes by Jodie to go with your hot and cold drinks served by Cathy and Maryann from the coffee-bee van out the back. Lorraine will also be along around 1pm with trays of Billingsgate shellfish. See Debbie Levett’s list of the talks that will be on in the comments below. A mobile prefab museum will be there to show some of the Isle of Dogs post-war history. Just to confirm Jane is visiting from the Mobile Prefab Museum and she will be holding a talk in our history room about the UK’s Post War Prefabs, as well as the ones on the Island. A number of our committee themselves grew up in an Island Prefab and hold fond memories. Living History at its best. 2pm We have committee members Con and Glen talking about the Islands Pubs past and present, in preparation of FoIHT writing a book on the subject next year. Our dedicated team of volunteers and myself will also be on hand to make it an enjoyable event for all and we hope to welcome you on Saturday! 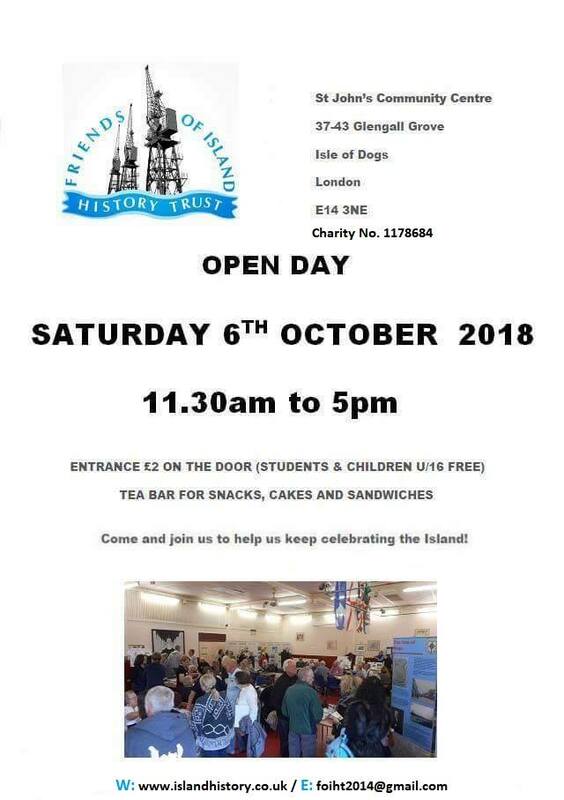 Thank you for the plug Alan, we would love to have members of your group join us here on the Isle of Dogs on Saturday, we are a friendly group of volunteers, who are always ready to talk about the history but as you rightly say we must carry on recording today.